I have been co-founder of two companies which ship physical products sold online, in doing so I tried out a few different open source systems for selling online – the first venture I used Magento and and OpenCart and for the second company we use WooCommerce. I chose to use Open Source eCommerce systems as I prefer to have full control over the installation and configuration of a site and be able to make any changes to the design and functionality that I like which ruled out hosted options like Shopify. I think this important when running an online store – hosted options are fine if you are selling a smaller range of products and for beginners who are not interested in or don’t have the skills to setup their own website – the difference is like between choosing WordPress.com and installing your own copy of WordPress from the .org download. I narrowed down my options to Magento, OpenCart and WooCommerce but there are a huge number of other eCommerce systems to choose from. I chose these to compare as I wanted larger more established software with an eco-system of themes and plugins around it – Magento launched in 2008 and is now owned by eBay, OpenCart was also launched in 2008 while WooCommerce is the newest option, launched to some controversy ( it forked an existing eCommerce plugin Jigoshop and took on the lead developers) in 2011. At the time of writing at ThemeForest there are 355 Opencart Themes, 387 Magento Themes and 242 WooCommerce Themes. In this post I am going to take a look at some of the pros and cons of each and why I now use WooCommerce on our eCommerce website. Magento was launched in 2008, initially named Bento by the creators of osCommerce who initially planned to fork that script but decided to rewrite it from the ground up. The company behind it, Varien then sold 49% of it to eBay who later went on to acquire the whole of Magento. They now offer an Enterprise version and a Community version which you can download for free here. There is a large eco system around Magento with the official site offering extensions and themes from their Magento Connect area. Themes there typically cost around $99 and extensions can be quite costly going from $100 up to $1000! Magento is aimed at larger eCommerce stores which need a lot of functionality – it is easily the most in-depth system mentioned here and will allow you to run large scale eCommerce operations with a lot of flexibility and customization that you would need. It can easily handle thousands of products with different currencies, payment systems, multiple languages, multiple store fronts – you should be able to achieve any functionality you need using this. While the back end is well-designed, the sheer wealth of functionality just out of the box will provide a steep learning curve for someone not familiar with it, be prepared to spend a long time setting up your site and reading through the documentation multiple times. This is not a script for beginners. The cost of extensions can also be very expensive, if you are used to free and $19 plugins for WordPress then it can be a bit of a shock to have to buy add-ons for several hundred dollars. If you need custom functions created by a programmer then they will typically charge more than their WordPress counterparts because the Magento system is so large and more difficult to work with. Another point to consider is hosting costs, Magento will run slowly on typical shared hosting so you will need a dedicated server or good cloud-hosting setup. If you are looking for a more simple eCommerce solution then an alternative is OpenCart, I found this a lot easier to setup and work with but it still has enough features to power most eCommerce stores and has a good amount of themes and add-ons. I used this running a PC game download store and was able to integrate it with Maxmind Geolocation and Automated phone call verification for orders ( PC Game downloads have a high rate of fraudulent orders). The site currently has over 14,000 extensions listed on the site, including over 2700 themes which range from Free to around $69 in price so cheaper than Magento themes in general. As mentioned, the price of extensions and themes is typically cheaper and there is a larger range of free addons, probably due to the system not being as complex to learn. The admin area is really well designed as you can see from the screenshot above and it is easier to learn than Magento – the site has solid documentation and a collection of screencasts to help you get up and running. There are a huge number of add ons for OpenCart and many of them are free – you would be able to get a site up and running using different payment gateways for no costs, where on other platforms you would need to pay for these. When using this script to run my eCommerce store I did find it was fairly slow out of the box, even running on my dedicated server but I managed to fix that by using a caching plugin, much the same as I use on WPLift – you can designate certain parts of the site to be saved as HTML and leave parts like the cart to be generated normally using PHP. I found it quite difficult to carry out modifications to the theme I was using – the template structure is quite difficult to understand and pieces of code are stored in the database rather than in HTML in the theme like WordPress, so be prepared to do a lot of hunting around to make basic changes to your theme. Another thing I found was the script didn’t produce search engine friendly URLs so again, I needed an extension to handle this – for an eCommerce site, this is essential so I would have thought this would be included in the base script. 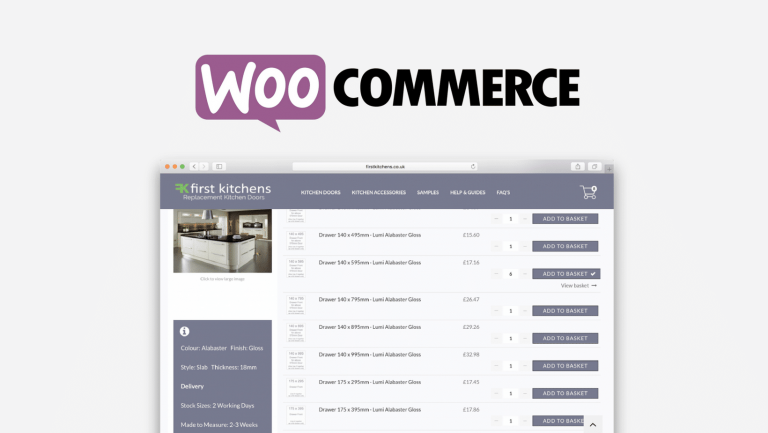 WooCommerce was launched in 2011 by WooThemes where is was forked from the JigoShop plugin, WooThemes are one of, if not the, largest WordPress theme companies so it has a large company behind it and has gone on to be wildly successful for them. It has a large amount of plugins and themes available for it – the added bonus being, because it is built on WordPress, most of the plugins for WordPress can also be used with it, making it have the largest amount of available addons of any of the systems mentioned here. Obviously the benefits I can mention here are also the benefits of using WordPress as a CMS in general – huge ecosystem, plenty of available developers, many free themes and plugins, extremely easy to install and use, regular updates, search engine friendly and can run on lower-end hosting, but they still apply when looking at using WooCommerce for your online store. When talking specifically about WooCommerce, I found it really easy to setup – you simply install WordPress as normal and activate the plugin and it will create the required pages for you. There is a good documentation section on the WooThemes site and a large amount of extensions available with prices typically around the $49 mark. WooCommerce does not include as much base functionality as the other options, so you will find yourself needing to purchase a good amount of extensions to get your required functionality – you will need to pay for different payment processors ( a simple PayPal one is included). If you need support, access to the forum will also need to be paid for with a support package. If you are not used to using WordPress then there will be learning curve in getting used to the system and the theme templating system. The cons of using WooCommerce also apply to WordPress in general – more hacking attempt,s due to it being so popular, mean you will have to stay on top of updates and install extra security layers, take a look at Rublon which we reviewed the other day. You will also need to check that updating WordPress core doesn’t break any plugin functionality. While Magento and OpenCart both worked perfectly fine for me and I was able to get the look and functionality I required with both – there was a steeper learning curve, I had to spend a lot of time tweaking and reading documentation. Searching for extensions and addons that I needed was also more difficult. With WooCommerce I was up and running within minutes and I had the whole of the WordPress plugin ecosystem open to me to add functionality to the site. I did have to purchase certain WooCommerce-specific plugins to get functions that I needed but that’s not necessarily a bad thing as with paid plugins you get support and updates should something break with a future WordPress update. If you are familiar with WordPress then you will have no trouble at all getting a site up and running with WooCommerce so that is my recommendation. If you are going to be running a larger enterprise scale eCommerce site then I would look at Magento, the system is really powerful and you can run very large online shops with features that you just wont find with other systems, but prepared to pay more money for addons and Magento developers. Which eCommerce system do you prefer and why ? Let us know in the comments. Thanks for the review of the plugins we use Woocomerce as our chosen solution as it works so well. We used to use CubeCart which has most of what you want built in however to add an mods on you have to edit the core files making updates a real pain. I have dabbled with Magento and agree about how complicated it is nothing is that straight forward to do. I have only used WooCommerce to date and really have had no serious issues with it. Where I have used it, it works well for the customers using it and that is my main concern. They’re happy, I’m happy. I have looked at Magento, mainly because eBay is behind it. I work with mostly small retailers and anything requiring a steep learning curve is something I prefer to avoid and that is the reason I have always used WooCommerce. It also seems to integrate nicely with a number of different themes if I am not using one of Woo’s themes, an added bonus for me. Appreciate the write up. I was in the middle of a debate of some sort on Themeforest, as some people on that thread mentioned that WooCommerce is only good for small businesses, and not those tho serve in terms of millions/month. thanks for this article and the arguments! I prefer WooCommerce for small shops that do not need complicated warehouse management. I would urge anyone to Stay Away from PrestaShop! But if you still have high hopes for it, then try it out for a couple of days before fully committing to it. Our experience on two eCommerce projects (in the same week) were such a disaster that we are in the process of developing a new eCommerce stores for these clients of ours – free of charge, because it wasn’t their fault we chose such a troublesome platform.